The geography of Texas is diverse and large. Occupying about 7% of the total water and land area of the U.S., it is the second largest state after Alaska, and is the southernmost part of the Great Plains, which end in the south against the folded Sierra Madre Oriental of Mexico. Texas is in the south-central part of the United States of America, and is considered to form part of the U.S. South and also part of the U.S. Southwest. Some regions in Texas[circular reference] are more associated with the Southeast than the Southwest (primarily East Texas, Central Texas, and North Texas), while other regions share more similarities with the Southwest (primarily far West Texas and South Texas). The upper Panhandle is considered by many to have more in common with parts of the plains Midwest than either the South or Southwest. The size of Texas prohibits easy categorization of the entire state wholly in any recognized region of the United States, and even cultural diversity among regions of the state make it difficult to treat Texas as a region in its own right. 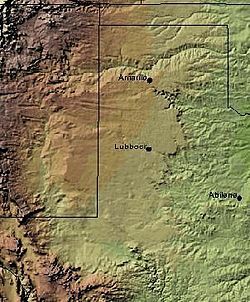 The Trans-Pecos Natural Region has less than 12 inches (300 mm) annual rainfall. The most complex Natural Region, it includes Sand Hills, the Stockton Plateau, desert valleys, wooded mountain slopes and desert grasslands. The Basin and Range Province is in West Texas, west of the Pecos River, beginning with the Davis Mountains on the east and the Rio Grande to its west and south. The Trans-Pecos region is the only part of Texas regarded as mountainous and includes seven named peaks in elevation greater than 8,000 feet (2,400 m). This region includes sand hills, desert valleys, wooded mountain slopes and desert grasslands. The vegetation diversity includes at least 268 grass species and 447 species of woody plants. National Parks include the Amistad National Recreation Area, Big Bend National Park, Chamizal National Memorial, Fort Davis National Historic Site, Guadalupe Mountains National Park, and the Rio Grande Wild and Scenic River. This area is part of the Chihuahuan Desert. Sands used for industrial purposes commonly have been found in the Texas Coastal Plains, East Texas, north central Texas, and Central Texas; and sand mines have opened in the Shinnery (dunes) ecosystem of northern West Texas and the eastern part of the West Wingtip. ^ a b "Texas Almanac". Retrieved 2016-06-25. ^ "Texas Escapes.com". Retrieved 2006-07-15. ^ "List of Geographical Regions in Texas". ^ "The Office of the State Climatologist". Archived from the original on 2006-07-06. Retrieved 2006-07-14. ^ "Tx Almanac". Retrieved 2018-07-03. ^ "About.com". Archived from the original on 2013-01-01. Retrieved 2006-07-11. ^ "Tx Parks and Wildlife". Retrieved 2006-07-14. 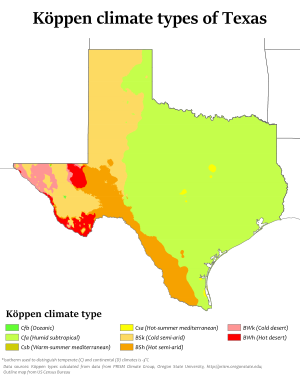 ^ "Tx Environmental Profiles". Archived from the original on 2008-06-03. Retrieved 2006-07-14. ^ a b c d "LoneStarInternet". Retrieved 2006-07-14. ^ a b c "Tx Environmental Profiles". Retrieved 2006-07-14. ^ "The Rolling Plains Region". Retrieved 2013-08-20. ^ Garner, L. Edwin. "The Handbook of Texas online". Retrieved 2006-07-11. This page was last edited on 10 March 2019, at 02:37 (UTC).